Sleepy Hollow students share time together during the Lunch Buddy Program. 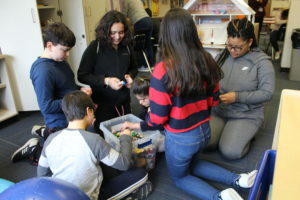 Seventh-grade students who have volunteered to be part of the Lunch Buddy program at Sleepy Hollow Middle School received a warm welcome from Special Education teacher Stephanie Castillo as they walked into her classroom one January day. Every other day students join special education students from Castillo’s and Kelly Whelan’s classes to have lunch and play games. The program is in its second year. The Lunch Buddies build Legos together, work on puzzles and dance – simple activities that have a profound effect. Students who may not have known each other now recognize each other as friends, creating an environment of inclusion and empathy.